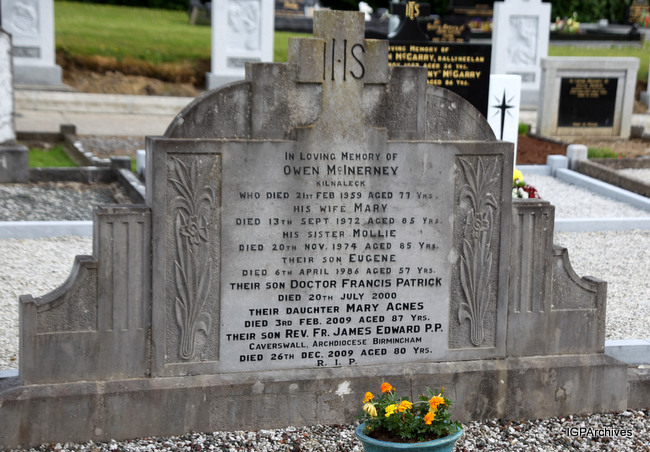 cavan-ballynarry -- In Loving Memory of | Owen McInerney | Kilnaleck | Who Died 21st Feb 1959 Aged 77 Yrs | His Wife Mary | Died 13th Sept 1972 Aged 85 Yrs | His Sister Mollie | Died 20th Nov 1974 Aged 85 Yrs | Their Son Eugene | Died 6th April 1986 Aged 57 Yrs | Their Son Doctor Francis Patrick | Died 20th July 2000 | Their Daughter Mary Agnes | Died 3rd Feb. 2009 Aged 87 Yrs | Their Son Rev. Fr. James Edward P.P. | Caverswall, Archdiocese Birmingham | Died 26th Dec. 2009 Aged 80 Yrs. | R.I.P.